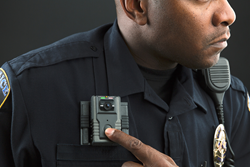 The City Council of Cedar Park, Texas voted unanimously to appropriate funding that will provide the police department with new body-worn cameras designed to work seamlessly as a single system with the department’s new in-car video camera system. The integrated system is manufactured by Texas-based WatchGuard, Inc. (“WatchGuard”), the leading provider of mobile video solutions for law enforcement. The WatchGuard integrated system allows the 4RE® HD Panoramic in-car and VISTA® WiFi HD body-worn cameras to intelligently collaborate, simultaneously capturing an incident from multiple vantage points, ensuring the entirety of the scene is available for review and analysis. When any camera in the system initiates a recording, the other cameras automatically sense a change in status and may begin recording based upon a configuration of pre-set criteria. Playback of captured video is synchronized in the Evidence Library 4 Web evidence management system and can be viewed simultaneously, hearing audio from the body camera while viewing video from the in-car system. “The prosecutor’s office is going to love it for being able to link and sync multiple videos at one time,” said City Council Member Michael Guevara. WatchGuard’s evidence management system allows agencies to use a secure cloud account to temporarily share copies of digital evidence files with prosecutors, investigators or anyone with an email address. Files can be assigned an expiration date for sharing and audit trails are created instantly and updated each time a file is uploaded, shared, viewed or shared again.